Dogs are masters of reading our body language, but how well can you read your dog’s cues? While observing a dog’s behavior, some signals are confusing and might not mean what we think. 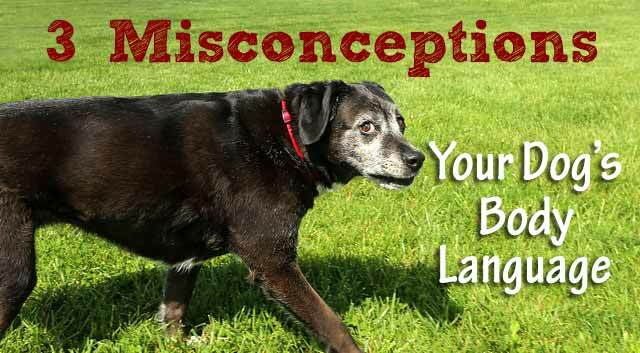 Have you ever heard any of the following statements about dog body language? Dogs wag their tails for a number of reasons. If their body is very loose or wiggly and they’re wagging their tail sideways or in circles, that’s probably a good sign that they’re friendly. An alert, dominant or aggressive dog may still wag their tail, but generally their body and the base of their tail is stiff or tense. A lowered tail that’s wagging back and forth quickly is usually a sign of a submissive dog. When you see a dog’s hackles, it doesn’t always mean the dog could become aggressive. If the hair on their back is raised between the shoulders and tail, the dog could be alert, excited or fearful. When the hackles are around the shoulder and extending up the back of the neck, it’s usually related to dominance or aggression. Haley raises her hackles along her back and tail area when she’s excited about meeting or playing with a new dog. Her tail will also become bristly when she’s on alert. Dogs may yawn when they’re tired but sometimes they yawn when they’re stressed or when they’re trying to calm another dog. Yawning is just one of the many calming signals used by dogs in various situations. I love this infographic created by Lili Chin. 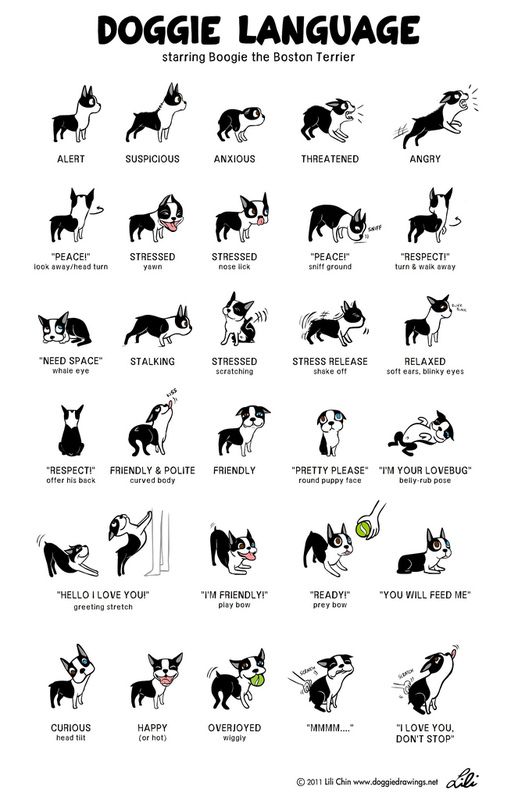 It’s been circulating on the internet for a while, but it’s still one of the best illustrations for decoding canine body language. Can Dogs Give Mixed Signals? Yes, sometimes dogs can have conflicted emotions and display mixed signals. That’s why it’s important to avoid focusing too much on just one signal. Look at their entire body and observe all of the various parts to get a complete picture of what they might be feeling. It’s also important to keep in mind that well-balanced dogs display a wide range of states. Sometimes they’re happy go lucky and other times they may be dominant, submissive or fearful. Here are some common characteristics to look for when trying to read your dog’s body language. The Relaxed Dog – The eyes are soft and blinking normally, the ears are in a half-back or relaxed position, the mouth may be open or closed but the jaw is relaxed, the body is relaxed and loose and the tail is held in a relaxed, straight or slightly lowered position. The Friendly Dog – The eyes are slightly crinkled or squinted, the mouth is usually open and relaxed (almost appearing to smile), the body is standing normally or loose and the tail is wagging softly or excitedly (with a wiggly rear end). A friendly dog may also whine or yelp if they’re excited. The Alert Dog – The eyes are open wide with an alertness (pupils may also be dilated), the ears are up and alert (possibly moving to tune in sounds), the mouth is most likely closed, the nose may be sniffing to gather more scent, the body is tense and stiff and the tail may be raised and stiff at the base with only the end wagging slightly. The Fearful Dog – The eyes are small and narrowed, the head is lowered with the ears back or held flat against the head, the corners of the mouth may be pulled back toward the ears, the body could be tense, frozen or in flight mode, hackles may be raised and the tail is low or tucked between the legs towards the belly. Less exaggerated versions of these same signals may also be present in a submissive dog. The Nervous Dog – The eyes are partly narrowed (pupils may also be dilated), the ears are half back, the mouth is closed and tense and may display calming signals (yawning, licking or tongue flicking) and the tail is lowered. The Dominant Dog – The eyes are wide and staring, the ears are up and facing forward, the mouth is open, the body is erect (and may be leaning forward), hackles may be raised and the tail is held higher (possibly bristled or wagging slowly). Dogs displaying an intense, hard stare with the corners of the mouth coming forward or showing their front teeth along with a very tense body and tail that’s stiff at the base, could become aggressive. The ability to read your dog’s body language gives you a valuable tool for helping your pup if they’re feeling uncomfortable, stressed or fearful. It also allows you to recognize potential problems with dominance or aggression so you can address the issue before it escalates. Do you rely on reading your dog’s body language? Tell us how it’s helped you or your pup in the comment section below! I love that Lili Chin poster. They had it out in my animal shelter, and I think it really helps potential families to understand what they’re seeing when they visit dogs. That’s a fantastic idea, Jean! There are a lot of first time dog owners that would find that really helpful when looking to evaluate and adopt a dog. Wouldn’t it be wonderful if they also gave people a printed version of it when they take their pups home? Great infographic! Never knew that about yawning, very interesting. Yes, the calming signals are very interesting, aren’t they? Haley will sometimes yawn when I’m teasing her and trying to get her to bark or “talk”. She’s probably trying to tell me that she finds it annoying, lol. Thanks so much, M.K. and I appreciate the share! ? These are some of my favorite behavior illustrations – I just attended a Grisha Stewart seminar and we reviewed all of these. Sherm especially uses the yawn cue all the time and Bruisy uses it with Sherm to let him know all is well, you can hang near me. 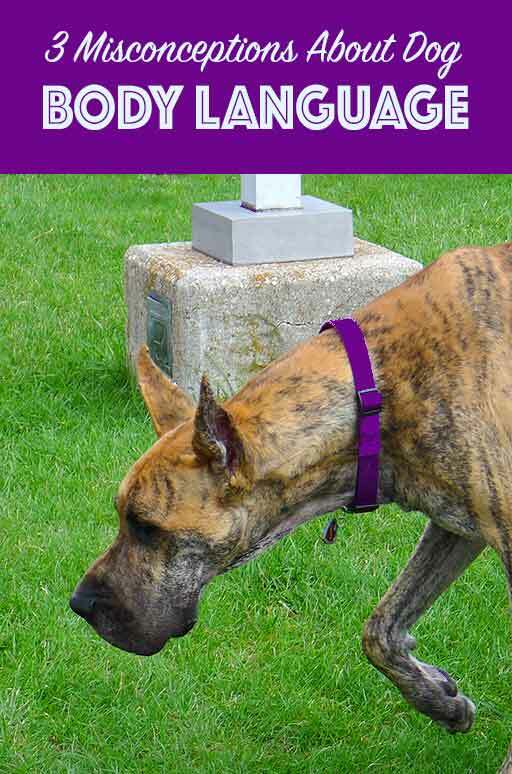 Great post as all dog folks should get to know these signals and signs! I bet the seminar was fascinating, Christine! I love studying and watching different dogs interact and observing their body language. I wish I could record a lot of Haley’s interactions with new dogs, because when I’m holding the leash, everything happens so fast it’s hard to analyze both dogs, especially if there’s some tension between them. You must enjoy watching all of those little cues between Sherm and Bruisy! ? I’ve learned most of these things as time has gone on having dogs, but I still have trouble reading my dogs sometimes. It’s especially good to know if you have a reactive dog and are trying to work with them on that though. I think I need that poster on my wall for the times I’m unsure! That’s a great point about reactive dogs, Jan! Knowing these signals could prevent a lot of uncomfortable interactions and would probably go a long way in helping a reactive dog overcome their fear or reactivity. Very helpful!! It’s so very important for dog owners to know what they see in their own dogs to be able to help them when their dogs need it! Exactly, Sally! I feel so bad when I see people misreading their dogs when they’re stressed or uncomfortable. Or even worse, when someone’s approaching to pet a dog that clearly needs some space. It’s so important for parents to teach their kids how to properly interact with dogs too. That would prevent so many dog bite incidents. I think I’ve seen that at least a hundred times too, Jackie. ? Thanks so much and it’s awesome that you figured that out along the way. If we pay close enough attention, they give us so many cues and clues into what they’re thinking and feeling. ? Wow! I learned something here today. I never really understood #2 – mainly because the Boys never really raise their hair (it’s so much there, if they did I’d never know) and I am/was one of those people who always thought it meant aggression too! Thanks, great post. I shall share! That’s so nice of you to share the post, Cathy. The hackles are interesting. I’ve seen a few dogs with raised hair on the back on their necks, but not too many. Thanks for great explanations . We have that dog language poster at work. That would be really handy for clients to see while they’re in the office. ?? Hi! I knew I was late commenting on this post but almost 2 months,! Good Grief, Sue! ? Anyway, I love this infograph – I refer to it a lot with Ducky around. The hackles thing I learned early on…Ducky raises hers at her tail end when she’s running the fence line with our neighbor’s little pup. And it’s all excitement in seeing her little friend. Of course, when she sees a squirrel to chase, it’s hard to tell if those hackles are raised in excitement or aggression cuz she would probably try to tear one up from limb to limb if she ever caught it. It’s never too late to stop by and add to the conversation, Sue!? I remember when Haley was young and her hackles would raise around her tail. I used to panic, thinking she was going to become aggressive, until I learned about the neck hackles. I’ve never seen her raise those neck hairs, but I have seen it in a few other dogs. Lucky for those squirrels, they’re pretty fast, haha! Thank you for providing very helpful information, and by providing pictures of different body language signs. This infographic will help dog owners a lot to care their dogs better.